I_rim = r^2 * m where m is the mass of the wheel and r = radius of wheel. But we know that the wheels actually have mass that is unevenly distributed along the radius so the moment of inertia I_wheel will be less than I_rim. Easy experiment to determine I_wheel if we know its mass. 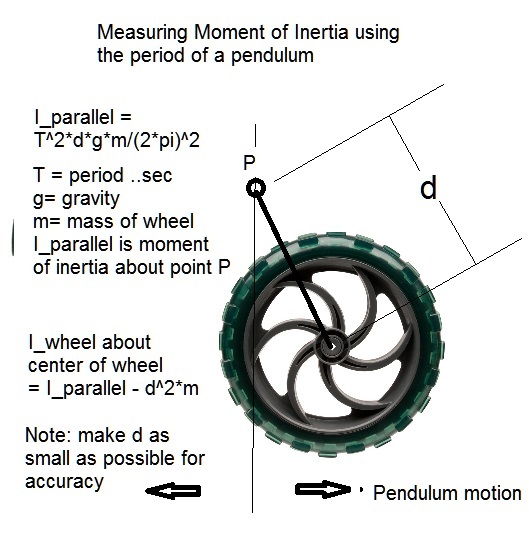 We can determine I_wheel experimentally using the parallel axis theorem and the dynamics of a pendulum. Parallel axis theorem says that any object that is rotated about an axis parallel to and a distance , d, from an axis going through the centroid of the object will add an amount = m*d^2 to the moment of inertia about its centroid. I.e. I_parallel = I_centroid + m*d^2 . T = 2*pi*sqrt(I_parallel/(d*m*g)) . g is gravitational constant and assumes swing angles smaller than say 10 degs from the lowest point on the pendulum path. Once we have I_parallel, we can now use the parallel axis theorem to determine I_wheel. This means that the wheel behaves as if the mass if located at 84 % of the radius of the wheel which one could almost guess by looking at it. This year’s FRC robot has a catapult arm that requires a reset wheel mechanism that will pull the arm down and release it automatically by just rotating a single “choo-choo” wheel. The exact linkage lengths and relative pivot point locations are determined by the attached excel program. I wanted to do a quick calculation for a student Vex robot that has 5 in wheels and is having one rail stalling during a turn. The stalling could have been predicted with some basic torque calculations. Using static moment equations you can easily derive the minimum torque to just turn for a symmetric robot with four direct drive motors on wheels with radius r . Legacy three-wire 6.5 inlb motors are assumed. Define the half spacing between axles as “l” and the half width between wheels as “w” , the robot weight as W_lbs and the coefficient of friction for a tire side force as u. Also assume that the weight is evenly distributed on the four wheels and the center of turn is at the cg. Also w > l so turning can occur. Input turning moment per wheel = w* torque/r and this must be greater than the moment resisting the turn caused by the side friction forces on the wheel. Resistance moment = l*W_lb*u/4 . The factor of 4 converts the W_lbs to normal force on the wheel. This represents about 60% of the old three wire motors 6.5 in lb spec torque . Clearly there is not much margin for any torque losses in the drive train or extra side friction on the wheels or extra weight from a heaver robot or from game objects. Also any contact forces resisting the turn will easily stall the turn. Using a 4 in omni wheel in place of the 5 in traction wheels increases the input torque by 5/4 and reduces the u by about 1/3 so we get a combined improvement of 15/4 or 3.75 factor on the required torque. min_torque_ 4 in omni = 3.75 / 3.75 = 1 in lb or about 15% of the available torque of an old motor. This is where you want to be in your design.